As the Christmas season is upon us, I wanted to share with you an effort to honour our veterans. Several years ago, I became aware of this organization and it’s efforts to remember the men and women of this country who have made the ultimate sacrifice FOR this country – they laid their lives down in service to us ALL and even for others world-wide. This morning while listening to the local news coverage, I heard that Wreaths Across America has only reached 9% of their financial goal to purchase wreaths for the thousands of veteran’s graves across the country. Wreaths will be placed NEXT SATURDAY DECEMBER 14th. 2. 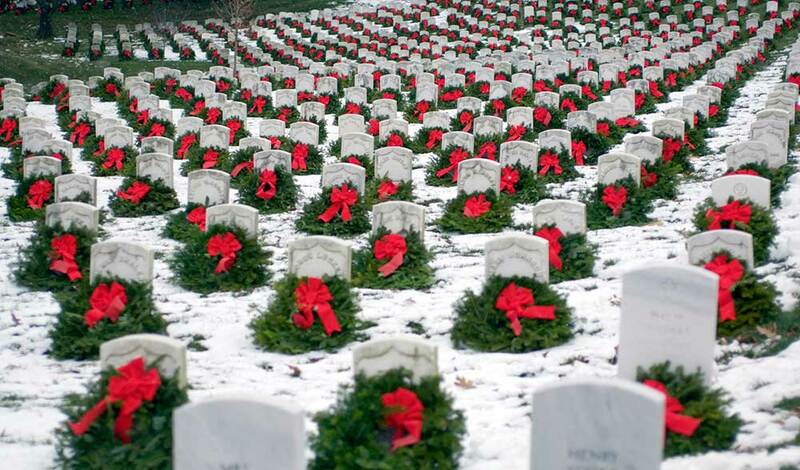 Volunteer: CLICK HERE You can go help lay wreaths at site’s across the country, including Arlington National Cemetery if you are local to it. Our mission, Remember, Honor, Teach, is carried out in part by coordinating wreath laying ceremonies a specified Saturday in December at Arlington, as well as veterans’ cemeteries and other locations in all 50 states and beyond. We also organize a week of events including international veteran’s tributes, ceremonies at State Houses and a week-long “Veteran’s Parade” between Maine and Virginia where we stop along the way to spread our message about the importance of remembering our fallen heroes, honoring those who serve, and teaching our children about the sacrifices made by veterans and their families to preserve our freedoms. We also coordinate veteran services and recognition through a variety of programs, and provide schools with teaching aides for projects throughout the year. Thanks for considering and feel free to reblog this to others AND SPREAD THE WORD!